After Forrester’s purchase of Springboard Research and PAC’s purchase of Berlecon, it’s clear that the resurgence of M&A activity outside the US is also influencing the analyst industry. However, there’s more at work than the generic impulse of investors to spread their risks from North America. Analyst firms are using acquisition to round out their business models and provide more distinctive and valuable service portfolios to clients. The same trends influence large and mid-size high tech firms, which face the same marcoeconomic challenges. Many analyst relations professions might not follow the global trends in equity markets, so Lighthouse organised a twenty-minute discussion between New York City-based advisor Pete Chatziplis from the Transatlantic Business Forum, and Lighthouse director Duncan Chapple. The two MBA graduates both graduated from the University of Manchester in the early 1990s and worked for Deloitte Touche Tohmatsu in the early 2000s. Over the last year there’s been a huge growth in mid-market buy-outs and cross-border purchases. Companies are looking to grow quickly across borders, rather than growing organically. Forrester’s strategic purchase of Springboard is a great example: it moved Forrester from being a marginal player in Asia, with just a few analysts, into a major player which will be able to raise up ex-Springboard’s research, client service and business development into a powerful engine. What’s interesting is the growth of mid-size firms looking for global expansion; firms that previously focussed on their domestic market now need to take advantage of international locations for vertical intregration (outsourcing and taking advantage of different quality and cost possibilities abroad) as well as for growing market share worldwide. Large multinationals, of course, have typically taken advantage of that more powerfully – often in a way which is surprising industry and financial analysts. Chatziplis also discusses the options for companies which are ‘big fishes in small ponds’: firms with previously strong niche profitability are searching to grow both profit and revenues. The US dollar is in a long-term decline which the US government does not want to reverse. That means that US companies investing abroad will benefit from the rising value of overseas business, even in mature markets, because profits will be worth more if they come in currencies that increase in value against the dollar. Chapple and Chatziplis point out that even quite large firms can be cautious about M&A and that for smaller firm the complexities of the M&A can have both huge opportunities and risks. Even a deal of $200 million will be too small for mainstream M&A advisors to be able to support, especially if it’s a cross-border transaction. Weak advice can produce huge problems: without being able to correctly analyse the opportunity the purchase might be badly structured and the integration of the business might be badly planned, especially since reorganisation is typically needed to allow buyers to make the post of their purchase. 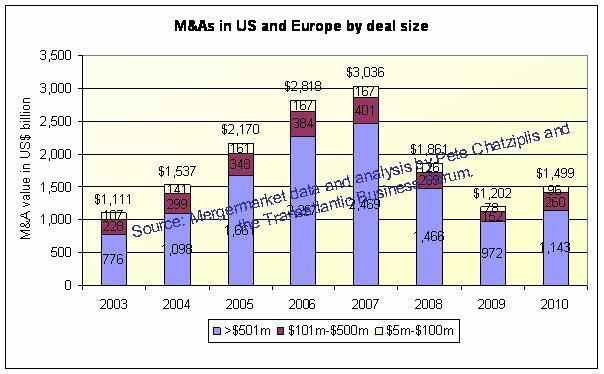 If not, poor integration in the M&A process can mean the value is not generated. You can hear the podcast at: http://lighthousear.podbean.com or use the player below.